When a sports season reaches it's conclusion there is a small break, a time to recover. Well wrestling has no off-season and while the biggest weekend in professional wrestling may now have past for another year, British Wrestling still has a packed weekend of action coming up. This week we're firstly head to Carlisle to celebrate an anniversary before going back south for the biggest show in a promotion's history. Then just to round off the weekend we'll jump across to Manchester on Sunday. Let's get Ready For The Weekend! Kicking off the weekend on Friday night and Target Wrestling are at The Venue in Carlisle to celebrate their 3rd anniversary. To celebrate their 3rd year, Target Wrestling have announced a trio of international names to compete. One of those names is 'War King' Eddie Kingston. A former CHIKARA Grand Champion, Kingston is well-known for his violent and physical style. His opponent is one of the most violent man not only in Target Wrestling but the whole of the UK. One half of the current Target Tag Team Champions; Chris Renfrew. Both of these men have held gold in numerous promotions during their careers and have done so with more than a hint of ruthlessness. It's not really a question of who will walk out the winner but rather who will go the furthest to win. While Renfrew faces a man of violence, his tag team partner and fellow champion, BT Gunn will compete against a world-renowned high flyer in 'The Juice' Juventud Guerrera. A former IWGP Junior Heavyweight Champion, Guerrera has worked for almost every international company on the planet. Gunn is considered to be the best wrestler in Europe by a number of fans and wrestlers. He could well cement that distinction this Friday with a win over 'The Juice'. 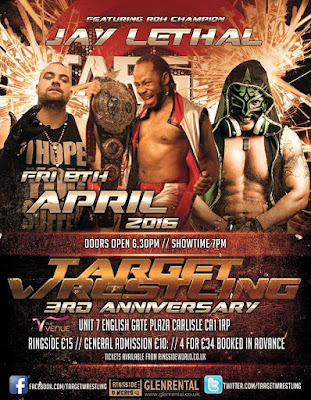 The main event for April 8th shall see the current Ring of Honor World Heavyweight Champion; Jay Lethal come to Target Wrestling. He will be competing against the current Target High Octane Division Champion; Shady Nattrass. However, while both men may be a champion, after this Friday, one shall not be as this will be a dual championship, winner takes all match. Lethal has won championship gold all over the world and could well add to his collection. Shady Nattrass has beaten some of the biggest international names in professional wrestling but a win to become the ROH World Heavyweight Champion would be the biggest yet. 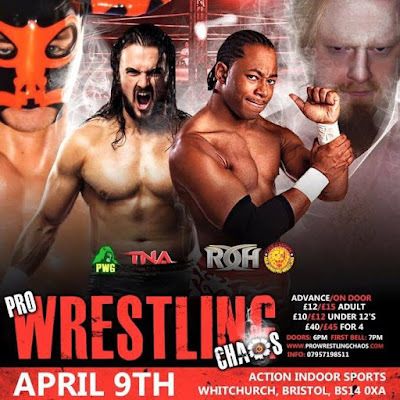 Moving on to Saturday and we head to Pro Wrestling Chaos who shall be holding their biggest event to date when they make their debut at the Action Indoor Sports in Whitchurch, Bristol. Now when we said this was their biggest show to date, we didn't mean in size although they have already broken their own pre-sale record. No, what we mean is that PWC will make genuine world-first history as the Ring Of Honor World Heavyweight Championship and TNA World Heavyweight Championship shall both be defended on the same show. Now you could excuse PWC for just using that news to make you want to come to this show. But that is not the style of PWC. This show is stacked from bell to bell! There are three championship matches, one of them a tables match. There is a Falls Count Anywhere match, a Ladder match, a Mountevans Rules match and a tag team championship tournament match! As we mentioned, both the ROH World Heavyweight Championship and TNA World Heavyweight Championship will be defended. Firstly, Jay Lethal shall be defending the ROH World Heavyweight Championship against 'White Lightning' Mark Andrews, a well-traveled, world-class wrestler in his own right and more than a challenge to Jay Lethal. 'The Pride Of Wales' Eddie Dennis, another hidden gem of British Wrestling, shall look to make history for himself as well on April 9th by becoming the first ever Welsh-born TNA World Heavyweight Champion when he challenges Drew Galloway for the gold. Mike Bird and El Ligero will look to settle their differences once and for all when they meet for a third time in a Falls Count Anywhere match. With each man holding one win over the other, they are without doubt going to do all it takes to pick up the deciding victory and end this long running rivalry. A few months ago, Pro Wrestling Chaos hosted a match between Johnny Kidd and Pete Dunne under traditional Mountevans Rules. For those unaware, Mountevans Rules dictate that a competitor may score a fall by pinfall, submission, knockout, technical knockout or disqualification with the winner being the most falls after three rounds. The match was so well received that Pro Wrestling Chaos have now brought Kidd back for what shall be one of his last matches. His opponent is a man who is the embodiment of the Mountevans era, Jack Gallagher. This match will be nothing short of pure wrestling joy. It is a chance to seem a legend in one of his last matches, doing exactly what he does best and doing it with one of the best. 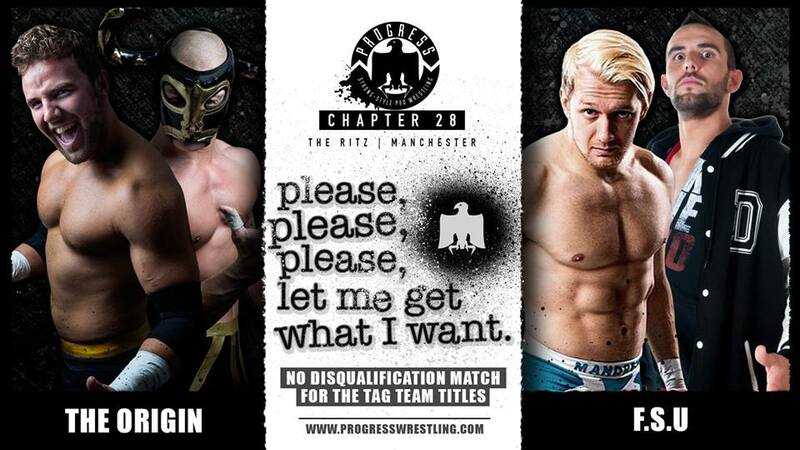 Finally rounding off the weekend and PROGRESS Wrestling are back at The Ritz in Manchester for 'Chapter 28: Please, Please, Please, Let Me Get What I Want'. Another stellar event is promised in Manchester with seven contests confirmed for this Sunday. Following Chapter 27, Mark Andrews and Eddie Dennis were attacked by The Origin in what has been an on-going saga between the two teams for a number of months. So PROGRESS have signed a match between F.S.U and The Origin's Nathan Cruz and El Ligero in an attempt to end this battle. The Origin's PROGRESS Tag Team Championship shall be on the line and the match shall be fought under No Disqualification rules. The Origin could continue their reign in PROGRESS or F.S.U could walk out as two-time champions. This past weekend, Marty Scurll made history with Will Ospreay as they fought in Dallas, Texas for the PROGRESS Championship. 'The Villain' walked out still the champion and will head to Manchester as such. However he will not be defending the championship again as he has refused to do so. While he may not be a defending champion on April 10th, he will be a competing one as PROGRESS management have announced that he shall be holding a non-title open challenge to anyone in attendance this Sunday. Whoever answers the challenge may not leave as champion but a win over Marty Scurll could well set them up with a future championship match. At Chapter 27, PROGRESS Wrestling announced a new championship and tournament that will take place in the coming months. The Atlas Championship shall only be open to those over the 205lb weight limit with the tournament to crown the inaugural champion consisting of two groups of four men with the winner of each group meeting in the final on September 26th. The tournament gets started this weekend and the first match shows us what we have to look forward to as T-Bone face Austria's Big Daddy Walter in a Group A match. Both men will want to start the tournament off with a win and make a statement on their intentions. Quite simply, we're getting a heavyweight collision this Sunday. ‘The Villain’ Marty Scurll vs ?? ?